Shown with Mayor Mike Stevens (right) is Rotary President Tony Thomas. Photo by Dr. Mike Barrow, M.D. 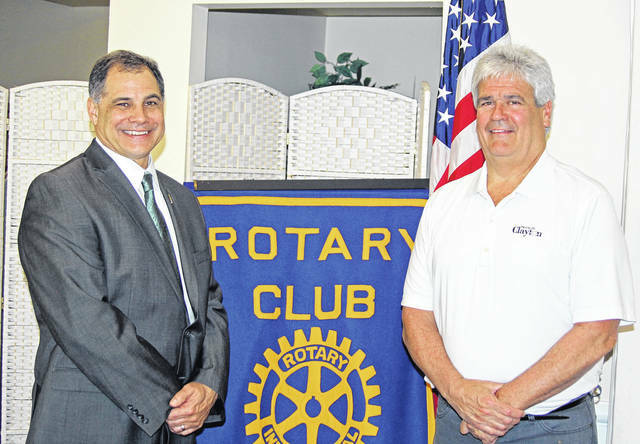 CLAYTON — Mike Stevens, mayor of the City of Clayton, updated the Northmont Rotary about activities in the city as well as future plans. He explained the development of Main Street with this being one of the entrances to the city. Also, he highlighted activities at Meadowbrook Golf Club. The club features virtual golf as well as banquet and event facilities. Clayton’s initial three-year street and curb project wrapped up in 2018. Concrete and asphalt that had outlived its useful life years ago have been replaced and city streets have never looked better. Planned improvements to Hoke Road, State Route 49, and Wenger Road are on the short term agenda. Major projects on Main Street and along Hoke Road will start construction soon. The city recently welcomed new businesses Casey’s General Store and Burger King. Clayton’s first Government Academy started the first week in September 2018.
https://www.englewoodindependent.com/wp-content/uploads/sites/26/2019/02/web1_Thomas_Stevens.jpgShown with Mayor Mike Stevens (right) is Rotary President Tony Thomas. Photo by Dr. Mike Barrow, M.D.